SED Solar Street Lights are immensely useful as stand alone source of light on streets and in premises, gardens and industrial complexes. It conforms to MNRE specifications. 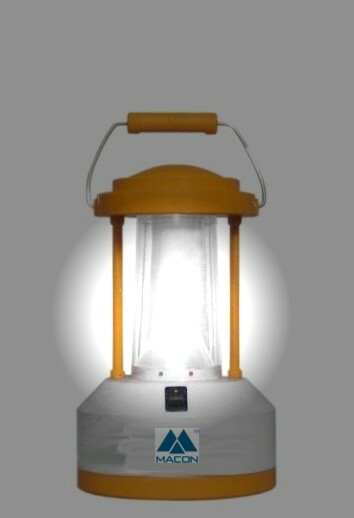 It is a packaged solar powered outdoor lighting system which provides easy and quick way of tapping the solar power. The system is very easy to install needing no special skills, tools or expertise. It provides a steady source of light in areas where conventional sources of mains utility are erratic, unreliable or unobtainable. It is independent and self-contained and hence needs no extra wiring or cables. It saves on costly transmission losses. 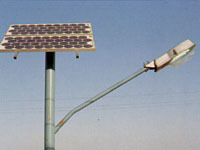 Solar street light is also available in Power LED version. The all-weather fixture comes 6W to40W capacity. It comes equipped with dusk to dawn charge controller and high efficiency power saving LED drivers inside. Multiple dimming and timing options available. Bright light of 900 Lumens from 11W CFL. Automatic on-off at dusk and dawn respectively. Special solar grade battery of 12V/75Ah. battery/panel, over charge and deep discharge. The Kits are available for OEMs which are suitable for LED lanterns operating on 6V/12V. These are with full protections and additional mobile charging output is provided. Kits come in ready-to-use conditions with terminals. No soldering needed. A very economical solution is available for remote areas. It employs LED lighting. A control box houses 12V/7Ah SMF battery, 10Wp SPV, 3 to 4 LED bulbs 3.5W. The box has mobile charging output as well. Available in total package in ready to use form. Self contained unit . No need for wiring. Uses 10 W panel. Mounted on the pole. Electronics and battery housed in weather proof enclosure. Full protections against reverse battery, reverse panel, overcharge and deep discharge of battery. Three LED indications. “Charging”, “Stand by”, “Battery Low”. Built-in provision for mains charging when sunlight is not available during dark monsoon days. Modular construction for ease of installation. If you need to supply water beyond the reach of the power lines, then solar power can solve the problem. Photovoltaic powered pumps provide a welcome alternative to fuel burning engines, windmills, and hand pumps. 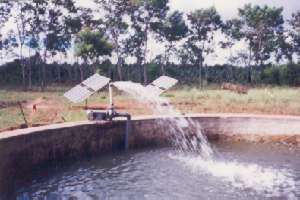 Thousand of solar powered pumps are working throughout the world. These produce best results during sunny weather when the need for water is greatest. Charge Controllers play the most important part in PV systems as they decide the conditioning of raw power from solar panels. These are normally available in two modes of operation, Series and Shunt. There are distinct advantages of both the types. In smaller power system, Shunt versions are found to be efficient and cost-effective. Whatever be the mode of control, these can be either simple on-off type with panel disconnect and reconnect set points or the latest PWM type. The later is found to be extremely efficient in maintaining SOC and life of battery. See advantages of PWM CHARGING . By default, all our Charge controllers are of PWM type. On-off versions are available on request. In higher capacity versions, temperature compensation is provided for better charging of the battery. While charging, battery should not be over-charged and while discharging (supplying current to the loads) it should not be deep discharged. To have these protections, all our controllers come with presets provided on kits to fine tune the requirement depending upon the application and type of battery used. Additional protections against reverse current flow from battery to panel during night, reverse connection of battery or panel and overloads at output are all provided as standard feature. Some controllers come with built-in LED drivers as well. 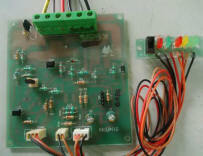 For systems using LEDs as lighting source, these controllers are cost effective and easy to implement balance of system. This is especially useful for LED based solar street lights. The charge controllers are available with Dusk to Dawn operation with programmable auto-dimming after a preset time. The time delay for dimming and percentage of dimming can be set as per requirement. This feature saves on cost of panel and battery in stand-alone LED based solar street lighting systems. To have better efficiency, the drop between PV panel and Battery while charging should be negligible. So also the drop between battery and load while battery being used to supply the power to the load. Additional, quiescent current (NLC) of the controller should be extremely small as it is continuous drain on battery. All our controllers, by default, use MOSFETs with totally circuitry have the lowest quiescent current. For OEMs, we have all the kits in ready to use form. The kits has easy interconnection features to make connections to Panel, Battery and Load. Terminals and relimates are provided everywhere so that no soldering is needed to implement BOS. Replacement of kit can be done by any non technical person as plug and play arrangement is found everywhere. Some standard kits are available in moulded housing to be used directly as independent unit. Taking into the need of the hour, most of our controllers come with MOBILE CHARGING output as well. Mobile charging cricuitry provided on board is of smps type with controlled charging current and full protections against short circuits. The mobile sets are thus fully protected against any overcharge while kit efficiency is maintained high. (All kits/units are available in PWM as well as on/off control with HVD and HVR specified by end user/OEMs)h.
You can download individual brochure from this table. Hassle free connection due to all relimate design. For fast production of solar home lighting system, 4 individual relimate cable for each load, 4 individual relimate for each switch. Relimate cable for indicator LEDs. 200Wp 200Ah/12V 12A <5mA 11V 14.4V <300mV <300mV Microcontroller based design. 12A Dual mode. Can be switched to D2D or normal mode by switch. Electronic overload auto-reset protection. Battery status bar graph display. Suitable for mid range home lighting system with the option of dusk to dawn operation. 50Wp 45Ah 3A <5mA 11V 14.4V <330mV <100mV All in one solar charge controller specially designed for small power home lighting system. Dual output. One with dimmable option. Can be used for dusk to dawn operation as well. Battery status bar graph. Dimming can be done in 4 steps of 25%. 10Wp/12V 7Ah/12V 1Amax <1mA 11V 14.4V <330mV <150mV 4 independent outputs through relimate cables. 4 independent switch cables. Relimate cable for mobile output interlocked with light load outputs. Interlocking arrangement by a slide switch to have either mobile out or load out. 10Wp/12V 7Ah/12V 1Amax <3mA 11V 14.4V <330mV <150mV Ideal for solar home lighting. Electronic overload protection to all outputs including mobile output. Mobile output is available all the time even when load output is there. Micro switch to reset over load condition. 4 indicator LEDs to show different status of operation. 5Wp/6V 4.5Ah/6V 1Amax <1mA 5.4V 7.2V <330mV <150mV 6V led lantern kit. (all relimates) Built-in led driver and mobile charging. Interlocking for lantern and mobile. 5Wp/6V 4.5Ah/6V 1Amax <1mA 5.4V 7.2V <330mV <150mV Very inexpensive solution for solar home lighting system.6V operation. (All relimates). Two independent outputs for bulbs. Mobile charging output. (Box) 75Wp/12V 72Ah/12V 5A <5mA 11.4V 14.4V <400mV <300mV electronic overload. With reset switch. smps mobile output socket. Suitable for small home lighting systems. 150Wp/12V 120Ah/12V 10A <5mA 11.4V 14.4V <300mV <300mV electronic overload. With reset switch.SERIES control. self diagnostic features. Suitable for mid range home lighting system. 200Wp 200Ah 12A <5mA 11V 14.4V 350mV @12A <300mV Compatible with motion sensor. For high wattage load upto 40W. Built-in led driver. Ultra low loss series control. Selectable load upto 40W. 80Wp 75Ah 5A <5mA 11V 14.4V <350mV <200mV Microcontroller based dusk to dawn controller with built-in led driver. Multiple dimming and timer options. Selectable load upto 18W. 75Wp 72Ah 5A <5mA 11V 14.4V <330mV <400mV electronic overload protection. Dusk to dawn controller in housing only.